Leading russian magazine "Lighting shop"
Leading magazine about the lighting industry for russian-speaking readers will help you to find new clients and to inform your current customers about the lighting products, renewal of the selection, special events and much more. You will be pleased to find out vast amount of free advertisement services as well as affordable placement of the commercial advertisement. How to make your brand well-known on russian lighting market absolutely free? 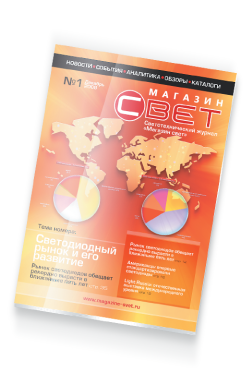 You can easily place a ready-made press-releases of your company in russian language. How can I make my brand famous on the russian lighting market? The cost of the basic informational support is $300 per month. This basic package includes the cost of placing information about the company and goods in Russian, translation and publication up to two press-releases per month. Every publication is backed up by aimed distribution of the advertisement materials by the subscribers database. You can receive additional information regarding the costs of placement or instructions how to publish information for free by contacting us throught the online web-form. 72.7% - of the visitors of the resource live in Russia. To contact us, write message in the form located below and press "Send" button. Thanks for your attention and interest.